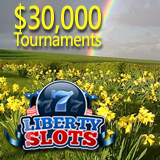 Spring has sprung and it's one slots tournament after another at Liberty Slots this month. First there's the The ‘Shower of Cash’ tournament that has just begun and continues until April 12. Then there’s the ‘Spring Money’ slots tournament that will pay out another $15,000 to tournament winners -- $5000 for first place. Liberty Slots offers more than a hundred slot machines from Wager Gaming Technology including Amanda Panda (which is awarding Double Comp Points this month). With the NFL Draft in the news so much these days it’s no wonder its football-themed slot Game Day has been so busy.